Employment Service facility in India has a long history. Till 1946, the facility was limited to the mobilization of service personnel and discharged war personnel. Directorate General Employment & Training (DGET) set up Sri Shiva Rao Committee and on its recommendation Employment Services were called upon to deal with the resettlement of large number of displaced persons as a consequence of the partition of India in 1947. Key objectives were the effective implementation of uniform policy and guidelines issued by DGET and diversifying its operations in the field of Occupational Research, Vocational Guidance and Employment Market Information. The administration of Employment Exchanges,thus formed, were handed over to the state Governments from 1956 to run them according to the DGET guidelines.The vacancies of Assistant Teachers in government aided schools were filled through the employment-exchanges till 1997,in West Bengal. Exchanges used to send the list of candidates seeking employment as per the requirement of the school.Interviews were held and the teachers were recruited subsequently. This author remembers of getting a post card sometime in late 70s, stating to be present before an interview board in a Government aided School. Things changed after the adoption of new liberal economic policies by both the central and state government in early 90s. With reduction in employment opportunities and continuously increasing number of unemployed youth, West Bengal School Service Commission was formed in 1997 for the appointment of Assistant Teachers in Government sponsored and government aided schools on the model of competitive examinations for employment. WB School Service Commission undertook first Regional Level Select Test (RLST) in 1998. Barring a year or two, RLST was conducted each year and in 2010, eleventh RLST was conducted. With the introduction of RTE Act in 2009, centre instructed all state governments to make the B.Ed degree mandatory for all schoolteachers from 2010. The then Left front administered government in West Bengal appealed to MHRD for a more flexible approach on the ground that not many candidates knew about the new rule. The state government had also said that the number of B.Ed qualified candidates was less than the vacancies in the state-run and state-aided schools. Centre permitted the State Government to put the decision, on hold, for a year but the recruits without B.Ed had to secure the degree through distance learning within two years of the date of joining and that those who had joined between March 31, 2001, and 2011 will be given time till 2015 to complete B.Ed and thatB.Ed degree will not be compulsory for teachers who had joined before 2001. In 2011, came PARIVARTAN. All the institutions set-up by the earlier Government went through significant changes after Ms Mamata Banerjee led Trinamool Government(TMC) came in power in West Bengal. In a zeal to put its marks,Twelfth RLST was conducted in the month of May of 2012, with radical changes in examination patterns. The total marks on which exam was to be conducted were increased to 190 instead of 100 marks set earlier for the exam.Emphasis was laid on the philosophy of education. Educational bars were lowered, B.Ed was not made mandatory, age limit too was relaxed, thus, increasing the number of applicants. The increase in weightage on interview is said to have increased the scope of manipulation. On 29.01.2014 through Memo. No. 209/5277/CSSC/ESTT/2014, West Bengal Central School Service Commission (WBCSSC) was formed after the modification of WBSSC Rules, 2007.WBCSSC issued the notice for 13th RLST (AT) during the month of April 2014 and published available vacancies to this effect. The application form along with the brochure was to be collected from the notified banks on payment of Rs250/- by the general/OBC candidates and Rs80/- by SC/ST/PH candidates and submit on the date to be notified at a later date. Though the above notification of 2014 never appeared, whereas the last date of purchasing application forms and brochure was 08.02.20142. The dates for submitting the application were never notified. One wonders what happened to application fees from lakhs of candidates,thus collected!!! A set of new rules were framed for the appointment to the post of Assistant Teachers for classes IX & X and for classes XI & XII by the Department of School Education, Government of West Bengal In 2016 and were published in The Kolkata Gazette,. According to the said rules, a notification for the appointment of tentatively a thousand teachers each in Work Education and Physical Education, 10,233 teachers for classes IX-X and 6,296 teachers for classes XI-XII was publishedin Sept 2016, under the heading of First State Level Selection Test (1stSLST) for Recruitment of Assistant Teachers in Govt. Aided/ Sponsored Secondary/ Higher Secondary Schools. A separate notice on the same month was issued with respect to theappointment ofAssistant Teachers in respect of Work Education and Physical Education. Application fees for General/ OBC candidates was Rs.250/- and Rs.80/- for reserved category.More than 2lakh candidates applied for about 20,000 vacancies. The MCQ based test for Assistant Teachers in Work Education, Physical Education, IX-X and XI-XII was taken in November and December of the same year. Based on the Test Result, qualified candidates were called for Personality Test. Final results comprised of 55% of Test result, 35% weightage of Academic as well as Professional qualification and 10% of Personality Test came out in May 2017. In the same month of May, final vacancies of Assistant Teachers to be filled through 1st SLST were announced to be 1,034 for Physical Education, 1,099 for work Education 12,906 for IX-X and 5,711 for classes XI-XII group. The final number of posts to be filled through SLST 2016 in class IX-X group increased by more than a quarter from the tentative estimation, where as the reduction of vacant teacher’s post by ten percent is beyond comprehension. 10+2 system of education was introduced in 1974 under the West Bengal Council of Higher Secondary Education Act, 1975 in West Bengal. Prior to 1974, schools used to impart secondary education (class IX to XI) after which the students had to go to the degree colleges for graduation.The change in education system from secondary to 10+2 was done without making provision for additional work pressure,infrastructure and faculty.Where, in rest of the country there is only one board for both IX-X and XI-XII;perhaps, West Bengal is the only state where School Education is under two separate Boards, viz. The West Bengal Board of Secondary Education and The West Bengal Council of Higher Secondary Education. During this transition period, degree colleges of West Bengal were asked to teach Higher Secondary courses along with their regular university courses, since most of the schools were not equipped with the infrastructure and faculty needed for the intermediate (10+2) study. Though the colleges under various universities did undertook the teaching of higher secondary course, they gradually withdrew in next 15 years,as the colleges were unable to cope with the additional administrative and educational load without additional resources,faculty and infrastructure. Moreover, they were not equipped with the work under the two types of administrations, under the WBCHSE and the University. There was perpetual scarcity of Class Rooms, Laboratories, Teaching and ancillary staffs etc. Accordingly, Higher Secondary students became a liability and the most neglected lot in the colleges. In the meanwhile, gradual upgradation of Secondary Schools was taking place. Coming back to the current recruitment of Assistant Teachers, problem started in May 2017, with the method of declaration of results and the hostility on the part of the West Bengal Central School Service Commission. Individual candidate could check her/his result on-line, but she/he could not get her/his ranking and individual score along with the breakup. No panel was formed, and the merit lists with individual scores were not published.When finally, upon the intervention of Hon’ble High Court the panels were made public, were without individual scores. The panels were divided in general, OBC-A, OBC-B, SC, ST and PH groups, whereas the vacancies were not. Panels and Waiting List in each category for each subject were published. Depending on the vacancy in each group, first panel was formed and all the candidates of the panel were asked to appear for counselling. Then there was waiting list having much more than the stipulated number of vacancies, which according to Rules3,4 should not be more than 1.4 times the number of vacant posts. These lists withoutscores created great confusion. Merit Lists being changed frequently; new names appeared in the list quite often. Example of Ankita Adhikari could be cited in this context. Ankita Adhikari ranked WL1 in the waiting List on 25.09.2018 for the subject of Political Science., whereas her name did not appear on the same list earlier on 15.8.20185. Incidentally, Ankita is the daughter of Paresh Adhikari, a former Food Minister in Left Front Government,who had just switched to TMC.Therefore,the allegations that the lists are being manipulated seems to have some basis. A candidate listed in OBC-B, will not be considered for the recruitment in general category, even if there is a vacancy and her/ his name is included in the panel.Here again there were few names that appeared in more than one panel. Candidates generally received counselling information on their registered mobile phones and rumours are that many times successful candidates were asked to come to a certain location for negotiating the price of appointment seems to have some ground. The news of such fraudulent activities, were so strong that WBCSSC had to issue a warning against such fraudulent activities and had to declare no connection of the Commission with such ‘fraudulent activities’as reported in newspapers and electronic media. Questions regarding the integrity of the system perceived by the aspirant teachers raised frequent complaining against the successful candidates with poor academic performance. Possibility of political clout, money and muscles playing a greater role in these recruitments could not be ruled out when such things were happening on ground. Even after the order of High Court on the contempt petition and being ordered to publish merit list along with score and provide to the court in 24 hours or otherwise “will be sent to the jail”, no such list has surfaced. Under Sec 8 of the rules for computation of vacancies of teachers is based on the reports submitted by the District Inspectors of Schools which will be duly approved by the State Government subsequently. It is also alleged that no new post is being sanctioned by the State Government after 2015 and vacancies are not being updated. The unfortunate incident of the death of two youths while agitating against the recruitment of two Urdu Teachers in Darivit High School of Islampur where no student had opted to study Urdu, is an example of such indifference from the government officials.Names of many schools with many vacant posts are not being shown in the vacancy list. Lack of transparency, rude denial of publishing the merit list and scores obtained further strengthen the confusion and allegation of favouritism and other malpractices. WBCSSC is mired with the controversies during last eight years. Dr Ranjit Basu, the then Chairman of WBSSC was immediately replaced by Professor Chittaranjan Mondal of Jadavpur University with the formation of new TMC government. With the announcement of twelfth RLST and refusal of Prof Mondal to succumb to party leaders’ recommendation she was forced to leave in October 2013. The 12th RLST was mismanaged as welland re-examination was conducted at many centres. The Minister of Education being unhappy with the report submitted by Prof Mondal on the said incident, ordered a fresh enquiry. The outcome of this enquiry is not yet known. On the very next day of Prof Mondal’s resignation, a Zoology Professor of Kanchrapara College, Pradip Sur, was appointed as the chairman of WBCSS. Prof Sur was Kalyani Town TMC president from 2007 to May 2013 and was Chairman of TMC – run Municipality for three years till 2013 when he had to step down on a no-trust motion by his own party colleagues. Prof Sur’s name was earlier linked with a chit-fund named “Sathi”. Mr Sur’s tenure ended in January, 2014 when his name appeared in financial irregularities in Commission’s fund. Prof Subiresh Bhattacharyya joined in the same month of January in 2014.He was, the principal-in-charge of Diamond Harbor Fakir Chand College.Later, he resigned from the job and joined as VC of North Bengal University in February, 2018. Mr Bhattacharya’s tenure of 4 years was marred with controversies and incompetence. It was in his tenure that notification for 13th RLST (AT) was published along with TET examination for teachers ofclass V to VII. The date for submission of forms for the 13th RLST was never announced. The allegations of corruption and nepotism were levelled against the Commission on various contexts. It was, in his tenure,that the 1st State Level Selection Test (SLST)replacing the RLST was conducted and controversies regarding the merit lists surfaced with subsequent court cases. Further counselling was stalled consequently. It must also be mentioned here that merit list for TET-2014 too wasnever publisheddespite repeated court orders. Incidentally it was Prof Bhattachayra, who recommended Ms Mamata Banerjee for D.Litt of University of Calcutta. Subiresh Bhattacharya on becoming VC of North Bengal University, resigned from the Chairmanship of WBCSSC and Dr Sharmila Mitra, Principal,Behala College, was appointed Chairperson of WBCSSCin July. After her joining WBCSSC in August, 2018 the process of appointment gained momentum. Both the panels, general and waiting of selected candidates (not to be confused with merit list) came out and the process of counselling and appointment orders were beginning to be issued. Those who joined in various schools claim to be informed by their senior colleagues that their recruitment was on the basis of 2015 requirements, not on the up-to-date vacancy. These new teachers narrate the stories of being overworked, extreme shortage of teachers in all the levels and incidents of History teacher teaching Mathematics to class IX-X. The government was not happy with the enthusiasm evident within 2-3 months of the joining of Dr Mitra. Dr Sharmila Mitra was keen in publishing Merit List and appointing Assistant Teachers accordingly. Therefore, within five months of her joining she was unceremoniously replaced by Sri Soumitra Sarkar, Principal of Jaypur Panchanan Roy College in Howrah in January 2019. Sri Soumitra Sarkar joined WBSSC on 10.1.2019 and on 16.01.2019, he informed that out of the 12,905 vacancies at the Madhyamik level (Class IX-X) counselling for 6,524 vacancies are completed,while speaking to the press.He announced, in addition, that the next phase of counselling will start from January end or beginning of February. It is not known whether these counselling are being conducted or not, but what is known now is that all the vacant posts are being filled. He further statedthat all the 1,034 vacancies in Physical Education and 1,099 posts in Work Education are being filled.In the same meeting he claimed that out of 5,711 vacancies for Assistant Teacher for classes XI-XII 4, 889 vacancies are filled and no suitable candidate is found for rest of the 822 posts.The question is why the waiting list candidates in all the subjects are on hunger strike for last 26days. Candidates whose name has appeared in the Waiting List have cleared the requisite eligibility criteria but are lower in ranking, therefore are being empanelled in waiting list. By all measures, they have proved their suitability for the vacant posts and must be appointed. It is history repeating itself. The result of 12th RLST, conducted in May 2012, was declared in the form of CMP (Combined Merit Panel).Before the name of each candidate was printed Empanelled. Out of approximately 1,000 candidates empanelled, only 252 youth were provided with jobs since WBSSC declared that it is not possible to provide employment to all the Empanelled candidates,violating the order of Supreme court and their own rules. Nearly 96 Empanelled SSC candidates went on hunger strike at WBCSSC office in February 2015. 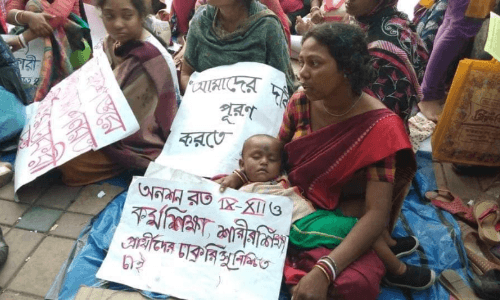 They had put up the hunger strike in two occasion in previous year too, but lifted the strike following assurance – once by WBCSSC Chairman and the top TMC leader, respectively. The striking students like the present one were not allowed to put a canopy overhead and were not allowed drinking water or use the toilet of the WBCSSC office. Many fell sick. The strike was broken on persistent threats of slapping police cases and arrest. Once again, in 2019 the government of West Bengal is showing its same heinous face. More than 400 aspirant teachers are sitting on hunger strike in front of Press Club Since February28, 2019. They, too, are not allowed to put a canopy overhead. Youth is forced to face the wrath of nature. Braving Sun, rain and hailstorm the strikers are rigid on their demand. One young girl’s miscarriage has not deterred them. Till date more than 70 youth have fallen sick. They are not provided with drinking water, even the Press Club authorities did not allow them drinking water or toilet. Irony is the Press which is witnessing the ordeal of these youth remains a silentspectator. The issue of WBSSC is not the only case of corruption in this country. All over country the same type of incidents are unfolding day by day. This year in Uttar Pradesh a big scam is unearthed in the recruitment of 68,500 teachers in Primary Schools. The protesting candidates were lathi-charged. Allahabad High Court has also quashed selection of 12,000 teachersin 2016, without following the Uttar Pradesh Basic Education (Teachers) Service Rule, 1981.In Meghalaya, appointment of 365 teachers in 2010 in the government’s lower primary schools was cancelled by Meghalaya High Court. No state remains untouched by such a scandal. Maharashtra is found to have appointed bogus teachers, Haryana appoints more teachers than advertised. Manipur, Tripura, Delhi, Rajasthan too has its own share of controversies. Former Chief Minister Om Prakash Chautala and his son was awarded 10years imprisonment for the corruption in teachers’ recruitment. Over 2000 crore Vyapam Scam of Madhya Pradesh is the mother of all scams. Corruption in recruitment is just not corruption, but is a political agenda. New liberal economy, that India pursues, does not allow permanent jobs. Its agenda is to destroy all government institutions and work for privatisation. With permanent job comes with the responsibility towards the profession. Permanent teacher worries about the well-being of students, they try to learn about student’s family background and are keento help them. They teach students democratic values to question and debate. On 14thJanuary, this year, the Chief Minister of West Bengal has announced an Intern Teacher Scheme. Under this scheme fresh graduates will get opportunity of teaching in various schools for an allowance of Rs 2,000/- to 2,500/-. According to Ms Banerjee, it is not possible to fill all the vacant teaching posts in school with permanent positions and, therefore,comes this brilliant scheme. Can you expect professional responsibility from these Intern Teachers? With such a meagre allowance, much much lower than required for subsistence such teachers will always be worrying to enhance their earnings. Private tuition will be the only means to make a reasonable amount of money. This will further break the education system in West Bengal. And that is what a fascist regime wants. It iskeen in destroying all the democratic institutions and want its people to be engaged in all kind of distractive and destructive activities than raising questions related to day-to-day events in life. Don’t raise questions regarding employment, broken education system or health care; go busy with go-raksha, mela, khela etc. Education is the backbone of the society. Asking for better education management is a right not only of the aspiring candidates but also ofevery citizen.Changing education system demands better technology for better learning and uplifting the standards of an average student. Highly skilled teachers are needed to accomplish this task globally. The number of teachers should be more to maintain the optimum teacher/student ratio for providing better standards of education to the students.Coming back to the questions raised by the SSC aspirants, on the recruitment of thousands of posts lying vacantfor so many years the government should pay immediate attention and recruit them immediately not just to satisfy their demand but to upgrade the general education standard of the state. Intern Teachers can never be an answer to the permanent recruitment agreeing to the fact that it is nothing but feeding the educatedunemployed youth with a meagre dole. Moreover, it vitiates the working atmospheres in schools. The process of appointment needs to be transparent and regular. All the vacancies must be filled within a year. It is the responsibility of the government to preserve democratic institutions. The vacancy status in each school must be updated immediately. Merit list should be published without further delay. The aspiring teacherson hunger strike are energetic, hard-working and have proven their merit.These candidates, should not be allowed to waste their energy and time in hunger-strike but must be effectively engaged in class rooms to exercise their performance ability. There are huge number of teacher-less schools which could be benefitted by these appointments, I presume.